Unbox Industries’ final release of 2017 is also one of The Blot’s favorite releases of the year! 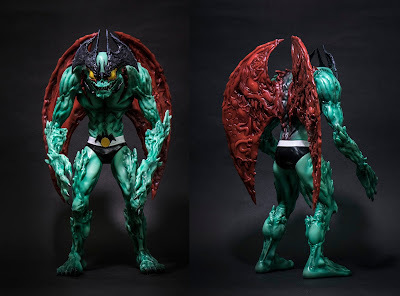 After over a year of teases, check out the final version of Mike Sutfin’s epic take on Devilman!!! 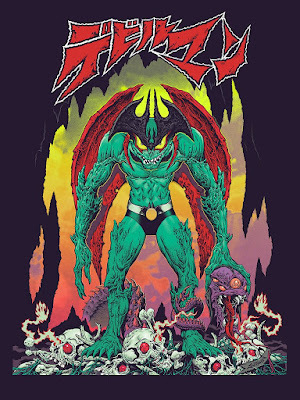 In 2015, Mondo and Mike Sutfin joined forces to conceive a collaborative print project inspired by the legendary Go Nagai's Devilman franchise. This resulted in a fantastic screen print released at MondoCon 2015. 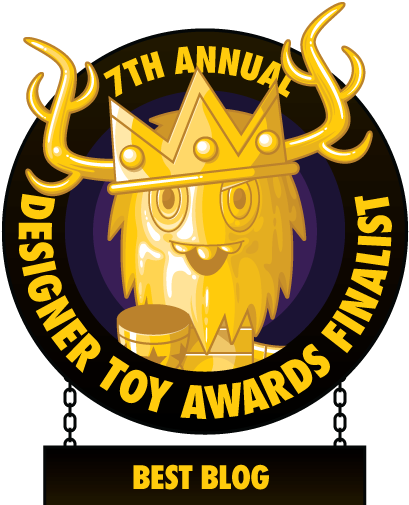 Fast forward to 2017, Unbox took over the creative reins to push Mike's original design into a three-dimensional soft vinyl figure under Sutfin’s watchful eye, which was eventually granted approval by Go Nagai himself. 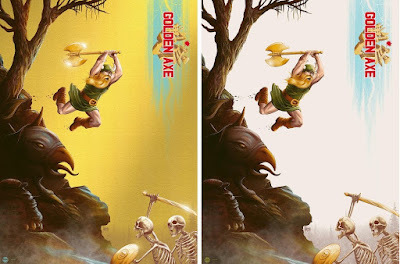 For this release, the Unbox team pulled together a variety of production techniques to create this unique interpretation without forfeiting the artist’s original concept. By utilizing a combination of traditional “sofvi” style manufacturing and injection molding the team captured the nuances of Mike's style perfectly. 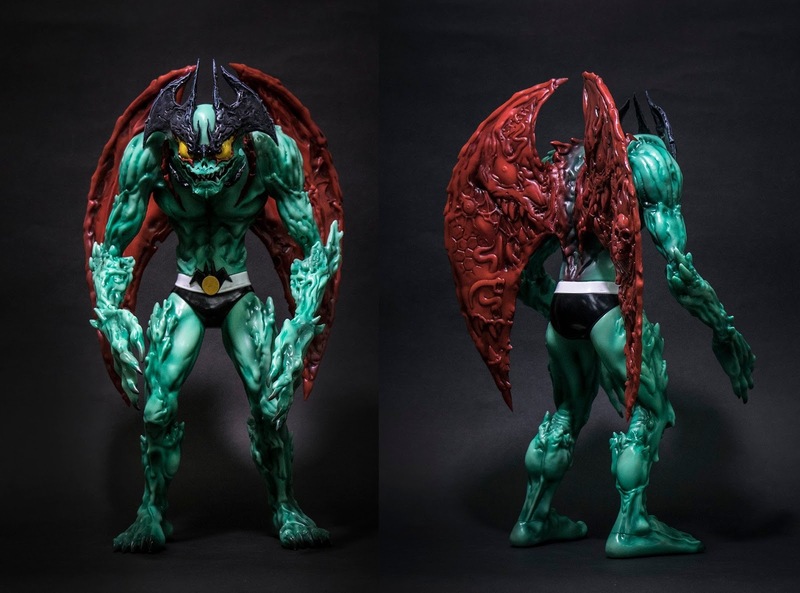 The Devilman Vinyl Figure by Mike Sutfin stands 32cm tall, is cast in soft vinyl and comes packaged in a printed box. Collectors can pre-order this killer new figure now at the Unbox Industries online store for $120. Scramble your plans for today as Mighty Jaxx has some egg-citing news! They’re set to unleash one of Jason Freeny’s cutest creations ever, Yolkels! 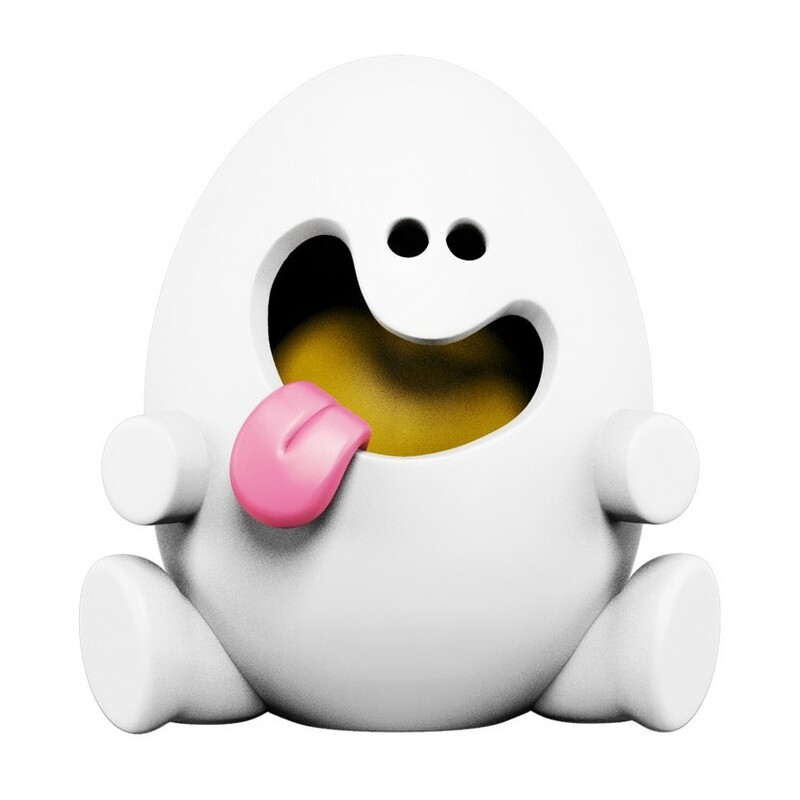 Yolkels is a cheeky egg with a great personality and a white detachable shell that unveils a little surprise inside. 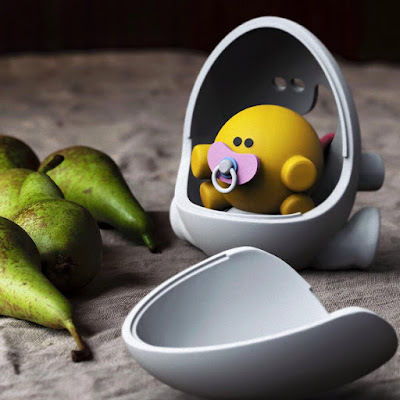 Open it up and you'll find an adorable baby Yolkel nestled comfortably inside with a pink pacifier in its mouth! The Yolkels vinyl figure by Jason Freeny stands 3” tall and is available now at the Mighty Jaxx online store for $40. 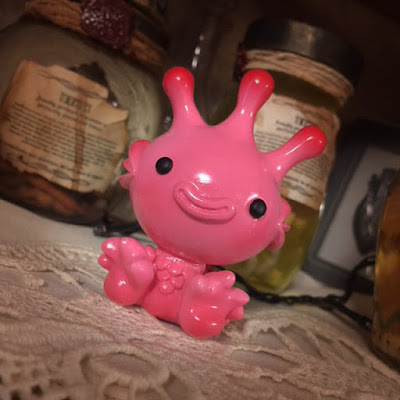 This little collectible is a bundle of joy that will bring a smile to everyone’s face! As the new year beckons, get cracking and give Yolkels a good home today. To close out 2017, Dark Ink Art, Acme Archives Direct and Zavvi UK have teamed up with superstar artist Grzegorz Domaradski (aka Gabz) to release this beautiful new Star Wars Episode III: Revenge of the Sith screen print, “Anakin’s Path”! This very dark Darth Vader poster is currently available as a timed release at both Dark Ink Art and Zavvi UK, while the limited edition variant is available exclusively from Dark Ink Art. 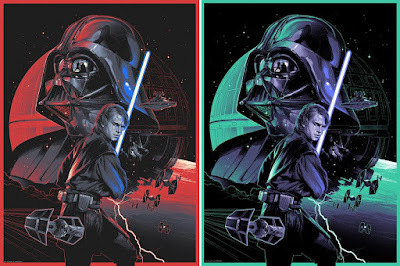 Anakin's Path by Gabz is an 18”x24” hand numbered Star Wars screen print. The timed release Regular Edition is currently available for pre-order from now through January 1, 2018 at 4am PST for $55, while the Variant is limited to 150 pieces and retails for $65. 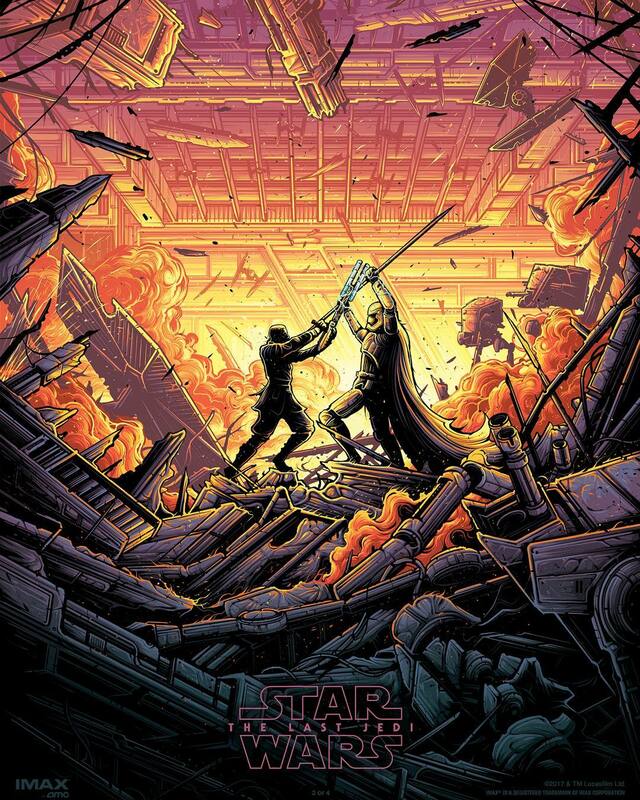 Check out this rad new Star Wars: The Empire Strikes Back screen print by Dan Mumford!!! “Cloud City” - produced by Acme Archives Direct and Dark Ink Art - features the galaxy’s most feared bounty hunter, Boba Fett, as he loads Han Solo frozen in carbonite onto his iconic ship, the Slave 1. 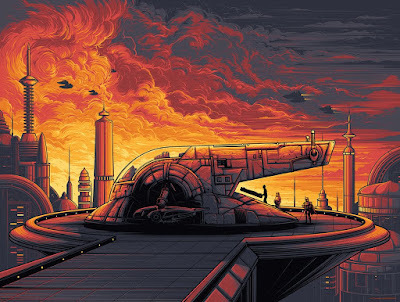 The red hued US Variant of “Cloud City” is available now at the Dark Ink Art online store. 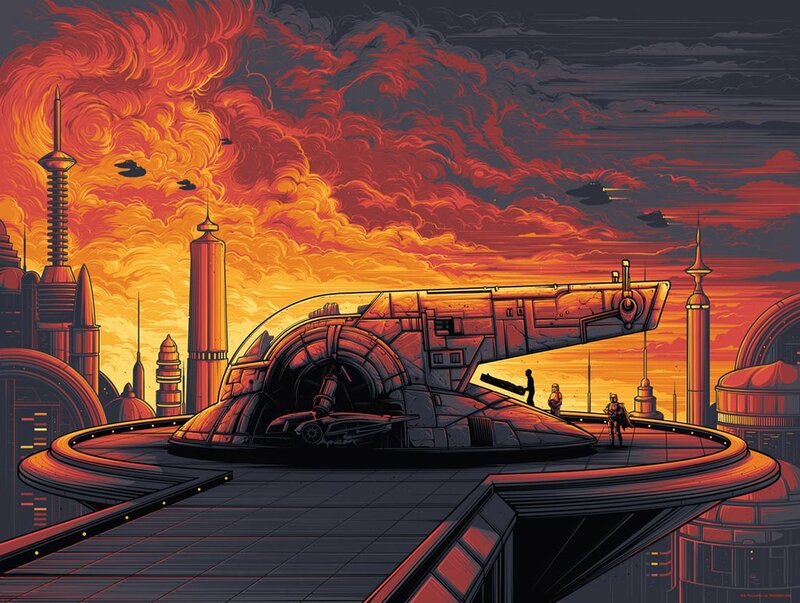 Cloud City by Dan Mumford is an 18”x24” hand numbered Empire Strikes Back screen print. The US Variant of this epic Star Wars poster is limited to 150 pieces and retails for $55. Check out this super rad Batman screen print by Gabz (aka Grzegorz Domaradski)! 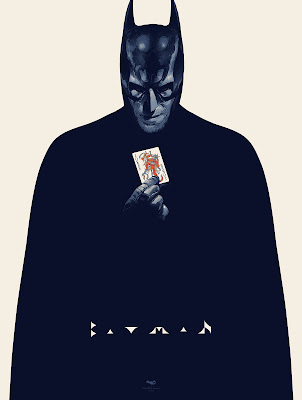 Produced by French Paper Art Club, this Batman (Special Edition) poster was first released during the Pop Culture Art Show in Normandy, which took place in the old Theatre of the City of Cherbourg earlier this year. DC Comics fans can now purchase this officially licensed poster at the French Paper Art Club online store! Batman (Special Edition) by Grzegorz Domaradski is an 18”x24” hand numbered DC Comics 6 color screen print on cream paper. It has a limited edition run size of 100 pieces and retails for €40. 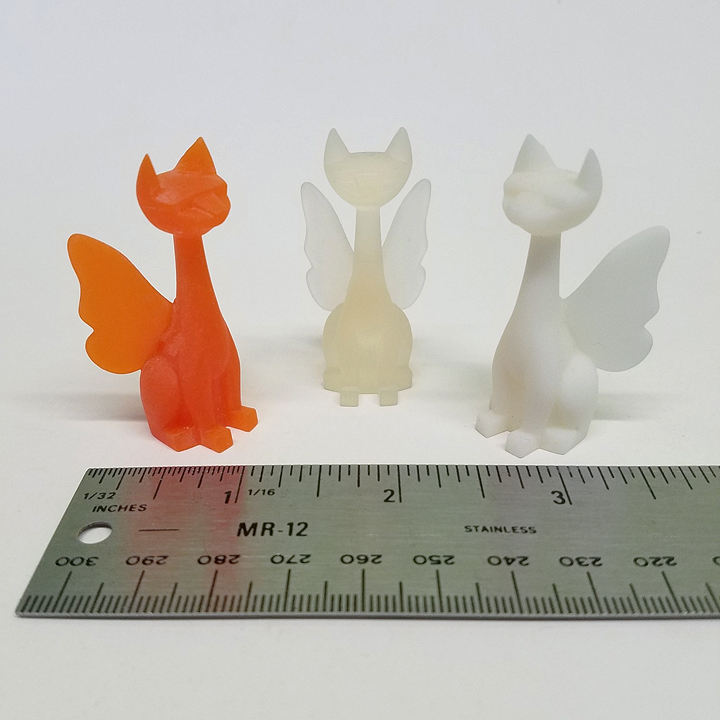 The newest addition to the Argonaut Resins family are these adorable micro winged Fairy Tuttz cats and Fairy Pharaoh Hound dogs! Only special people have the ability to see Fairies… can you see them!?! What’s cool about these micro Fairy Tuttz and Pharaoh Hounds is that they’re 3D printed in resin right from END’s printer and are a very similar consistency to the resin he casts his other collectible figurines in. 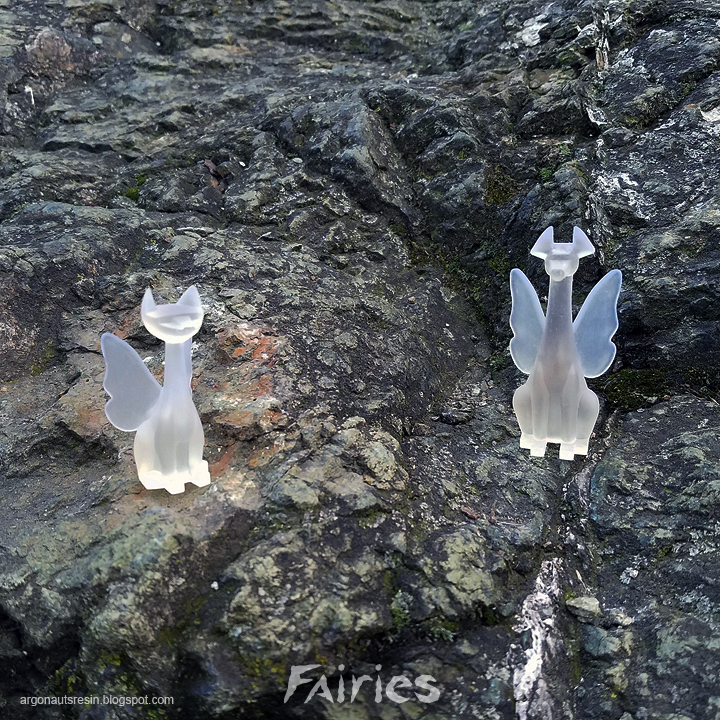 Each Fairy Tuttz stands 2” tall while the Fairy Pharaoh Hound stands 2.75” tall. Both come in a variety of colors. Good luck trying to catch one of these rare spirits! 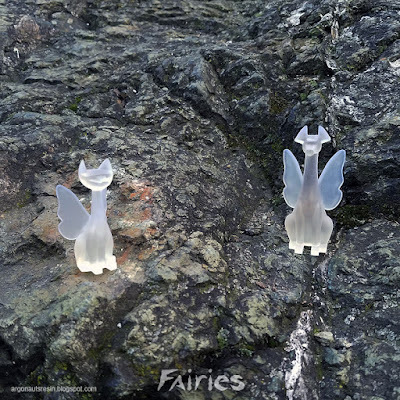 The Spirit Edition Fairy Tuttz and Fairy Pharaoh Hound micro resin figures comes in a translucent white colorway and can be purchased now at the Argonaut Resins online store for just $12-13 each! 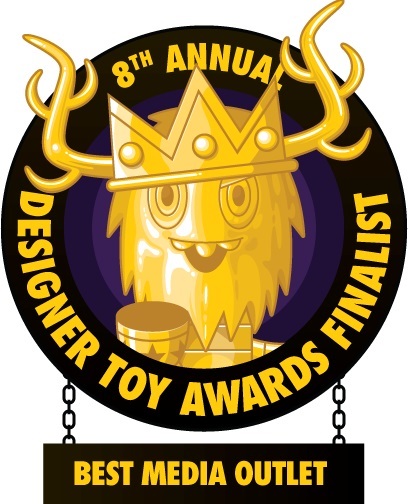 What better way to kick off 2018 than with a release from UME Toys! Meet the UK artist’s newest creation, Tom SeaBottom the Sea-Monkey! Who lives in a castle under the sea? Not that yellow sponge, but Tom SeaBottom. 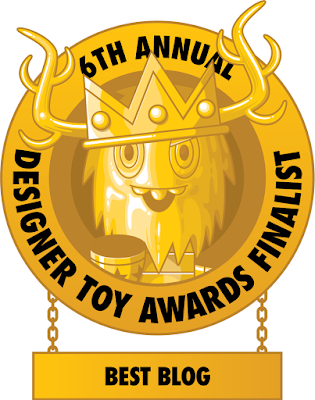 Sitting around 3” tall, Tom SeaBottom will ship in a header carded bag along with an exclusive SeaBottom sticker. Fans can purchase this little cutie at 9am London time on Monday, January 1st, at the UME Toys online store for £22.50. Golden Axe by Mike Saputo is an 18”x24” hand numbered SEGA screen print. The Regular Edition ($45) is a 9 color print on French Durotone Butcher Off-White paper and is limited to 175 pieces, while the Gold Foil Variant ($65) is a 10 color print on Brilliance Gold Foil paper and is limited to 100 pieces. Both posters will go on sale at 1pm EST today, Friday, December 29th, at the Skuzzles online store. Mighty Jaxx is ending 2017 with a killer new release by acclaimed Japanese artist Touma! 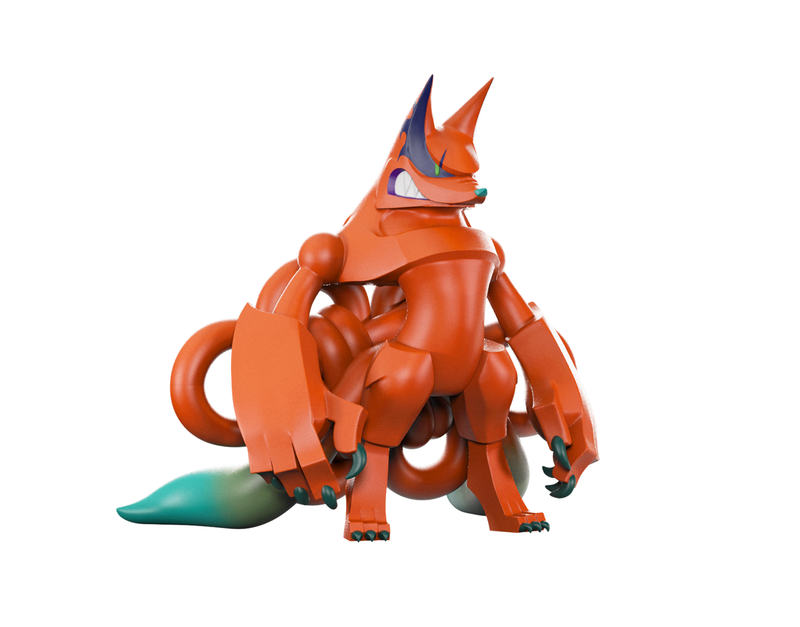 Check out the Neun Schwanz Fuchs vinyl figure, Touma’s interpretation of the nine tailed Fox. Although it has quite a menacing look, the Neun Schwanz Fuchs is known to be a bringer of auspiciousness, protection and peace. 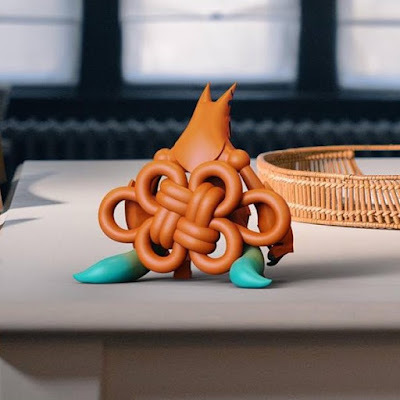 Attached to the Neun Schwanz Fuchs’ back is a traditional Japanese braid, also known as kumihimo. Despite its simplicity, each cord of the braid is imbued with meaning and symbolizes the links of positive character and strong interpersonal ties. This Saturday, December 30th, at 10am EST collectors can get their very own nine-tailed collectible, designed to keep the good in your life whilst banishing the bad! The Neun Schwanz Fuchs by Touma stands 8.5” tall and will retail or $99 exclusively at the Mighty Jaxx online store. Each Sunday, from December 17th through January 7th, guests who purchase a ticket from AMC Theaters to see Star Wars: The Last Jedi in IMAX will receive an AMC exclusive Star Wars print from artist Dan Mumford! AMC did a similar promotion with Mumford for The Force Awakens and it was a huge hit. The Blot expects fans to be equally rabid about collecting this new set of prints. The third print in the series features the potential final battle between Finn and Captain Phasma. The final print will be unveiled next week. Each free poster measures 9.5”x13” and states “4 of 4” at the bottom. To commemorate Free Comic Book Day 2018 on Saturday, May 5th, Diamond Select Toys will be releasing this FCBD 2018 Exclusive DC Comics Batgirl and Nightwing Vinimates 2 Pack! This fan-favorite dynamic duo will swing into action exclusively at participating local comic book stores on FCBD. These 4” tall DC Comics vinyl figures are sculpted in Diamond Select Toys’ signature Minimates block-figure style, each striking an iconic pose straight from the comics and featuring ball-jointed neck articulation. 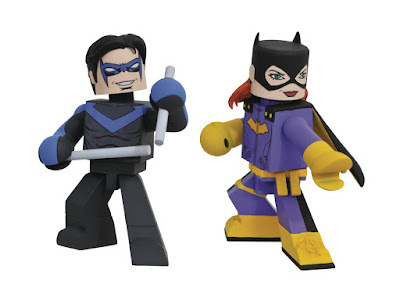 This Free Comic Book Day 2018 Exclusive Nightwing and Batgirl Vinimates 2 Pack will be packaged in a full-color box and retail for $19.99. The heroes and villains of the DC Universe are back in Diamond Select Toys’ third series of comic book based DC Comics Vinimates! 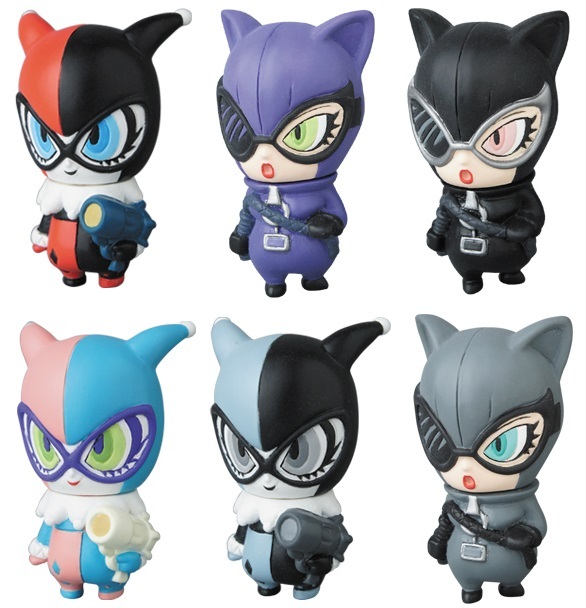 This exciting new series includes classic blue and grey suit Batman, Catwoman and Batwoman. 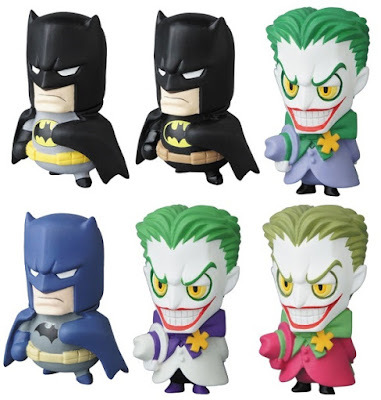 Each blocky 4” PVC figure strikes a distinctive pose based on their appearances in popular DC comic books, and features ball-jointed neck articulation. Each DC Comics Vinimates Series 3 Vinyl Figure by Diamond Select Toys comes packaged in a full color window box perfect for display. All three figures seen here can be pre-ordered now at Entertainment Earth for $9.99 each here. Diamond Select Toys’ DC Comics Vinimates toy line continues with a new wave of figures based on the popular video game Batman: Arkham Asylum! 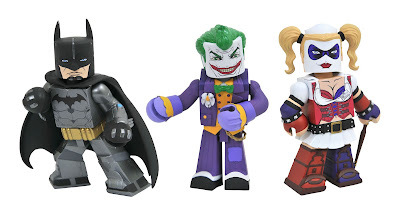 Ripped from the screen of the popular video game franchise, the Arkham Asylum Vinimates Series includes Armored Batman, The Joker and Harley Quinn. Each blocky 4” PVC figure strikes a distinctive pose based on their appearance in the video game, and features ball-jointed neck articulation. Each Arkham Asylum Video Game Vinimates vinyl figure comes packaged in a full color window box perfect for display. All three figures seen here can be pre-ordered now at Entertainment Earth for $9.99 each here. Diamond Select Toys’ DC Comics Vinimates toy line continues with a new wave of figures based on The DCW Arrowverse! This newest wave of DC Vinimates vinyl figures is based on the popular The CW television series, Supergirl. Each blocky 4” PVC figure strikes a distinctive pose based on their appearances in popular DC x The CW tv show, and features ball-jointed neck articulation. 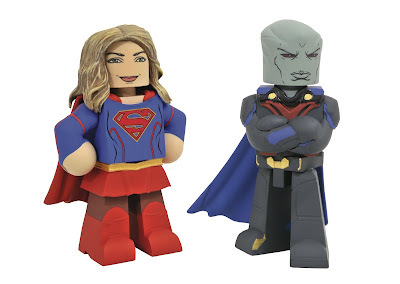 The Supergirl TV Series Vinimates Series includes Supergirl and Martian Manhunter. 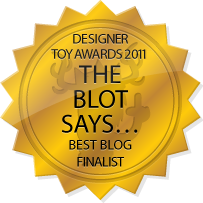 Each vinyl figure comes packaged in a full color window box perfect for display. Both figures seen here can be pre-ordered now at Entertainment Earth for $9.99 each here. 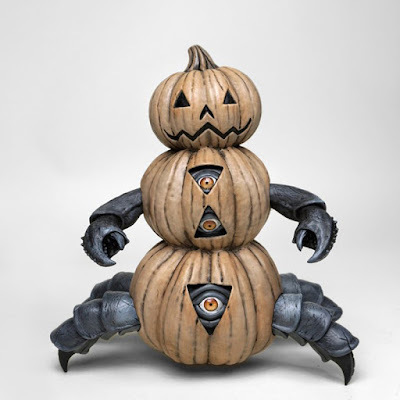 ToyQube has released the second colorway of artist Jim McKenzie’s awesome “Beneath the Harvest” Pumpkin Crab vinyl figure in a fantastic monochromatic colorway featuring black, white, grey and orange! The Pumpkin Crab features a wild design blending a triple stack of pumpkins with a large crab lurking within. 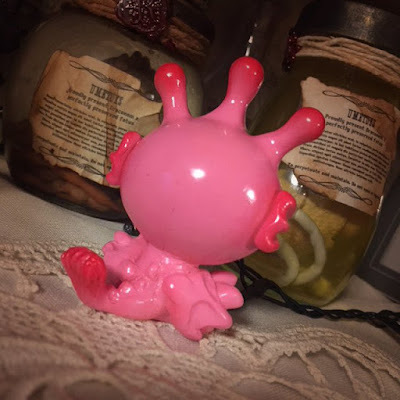 This wonderful creature was previously released by McKenzie as a low run resin figure, and now the Pumpkin Crab returns as a detailed production vinyl figure. 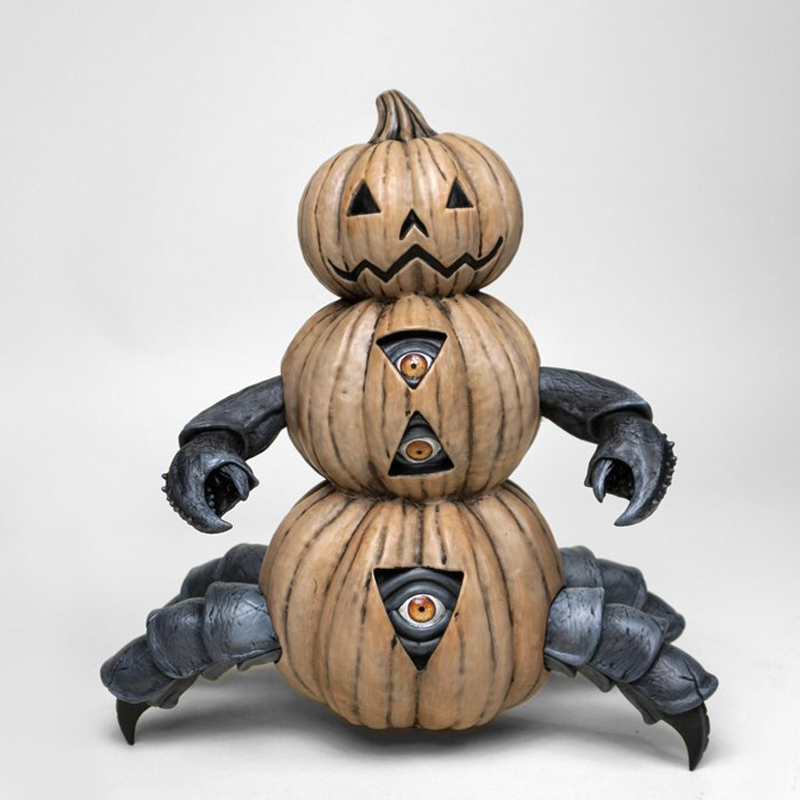 The “Beneath The Harvest” Pumpkin Crab Mono Edition vinyl figure by Jim McKenzie measures 10.5”x9”x7” and is limited to 100 pieces. Collectors can order one now at the ToyQube online store for $145. 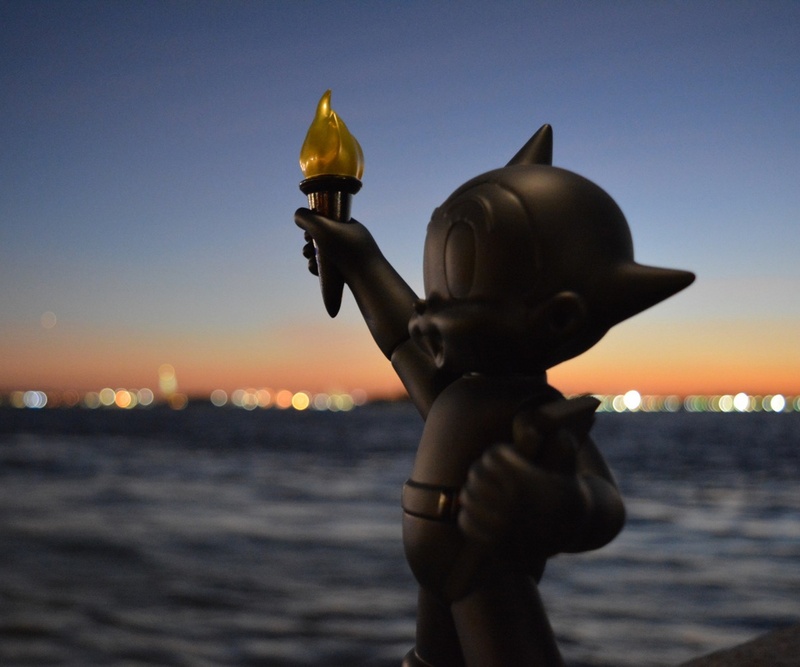 ToyQube has released the fourth colorway of their fantastic Astro Boy Statue of Liberty vinyl figure! 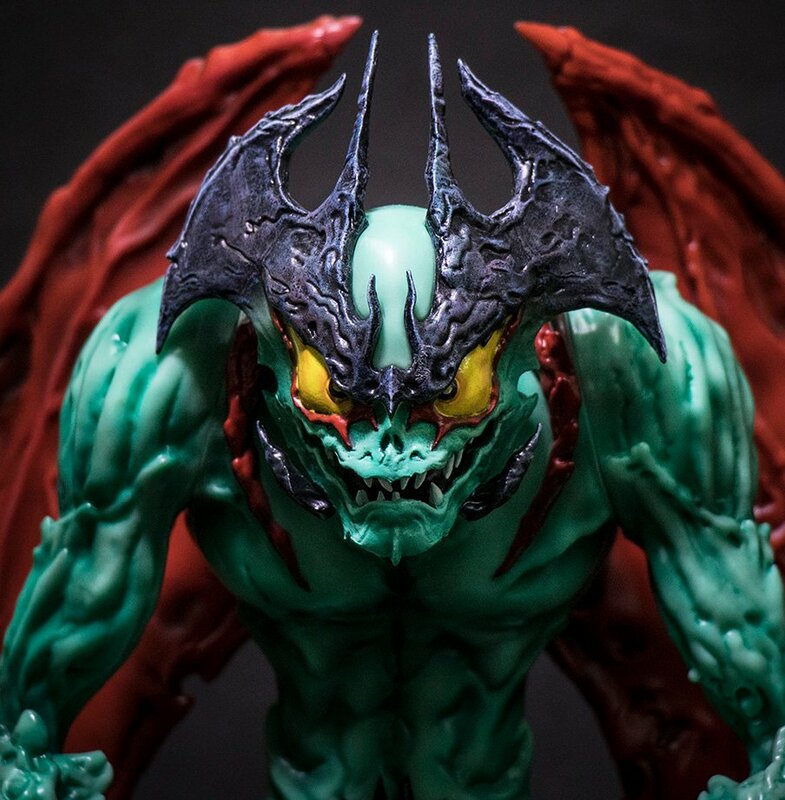 This officially licensed figure produced in conjunction with Tezuka Productions is now available in an all black colorway featuring what appears to be a metallic gold torch flame. 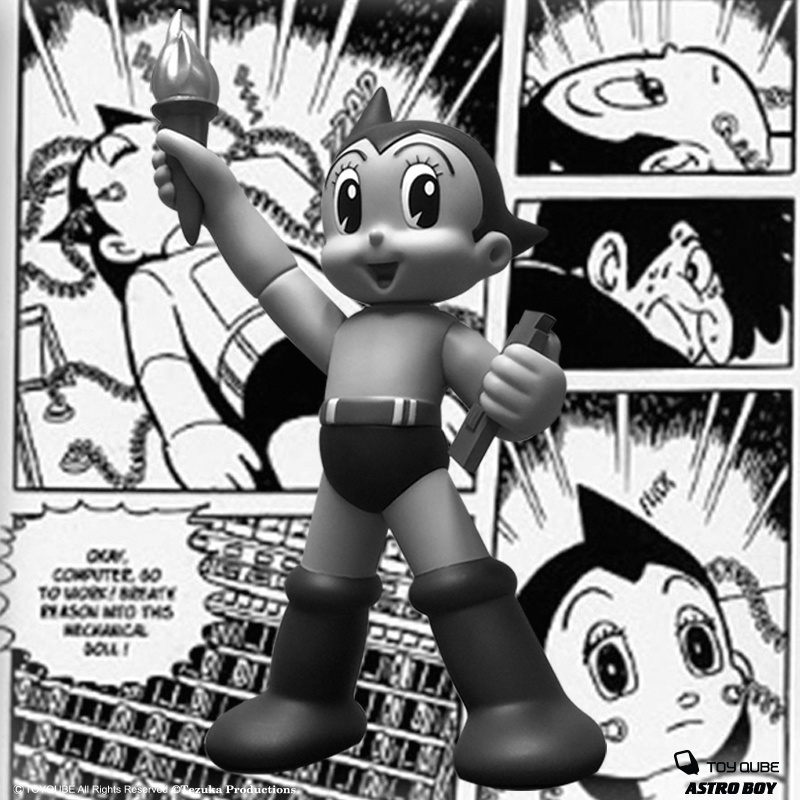 This black version features Astro Boy’s birthday on the tablet in his left hand. 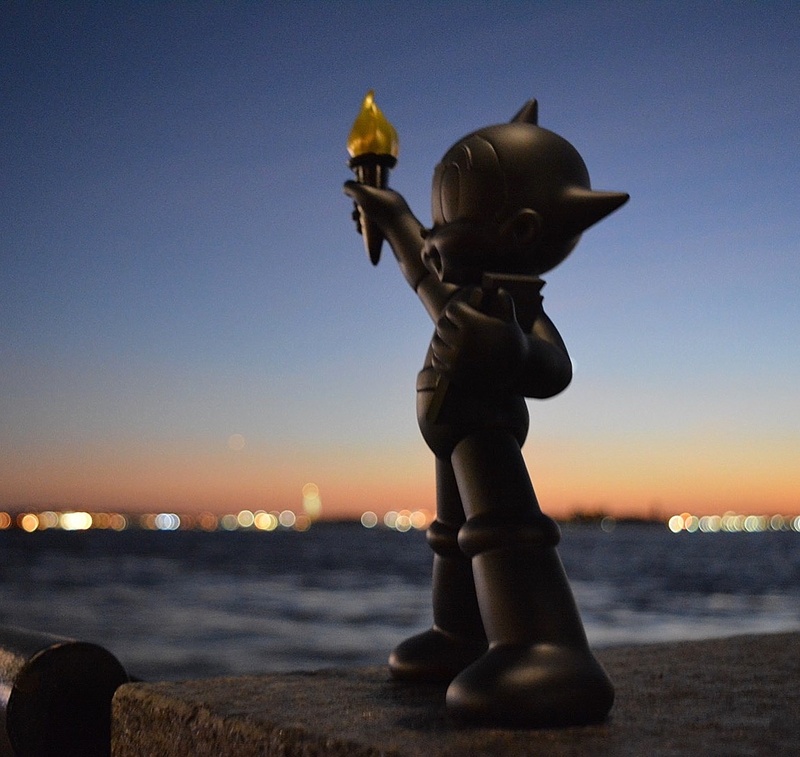 The Astro Boy Statue of Liberty Black Edition Vinyl Figure stands 9” tall and features articulation at the neck. Collectors can order this awesome collectible now at the ToyQube online store for $99.99. 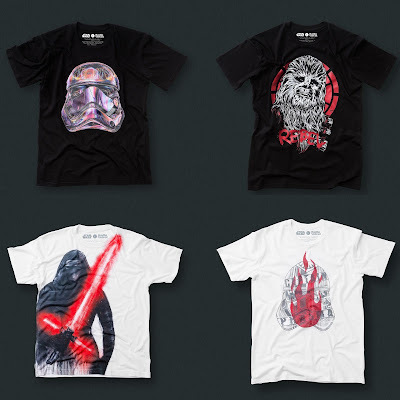 RadioVelvet has teamed up with Lucasfilm to release a really killer, officially licensed Star Wars: The Last Jedi t-shirt collection designed by some of the most innovative artists from Australia! 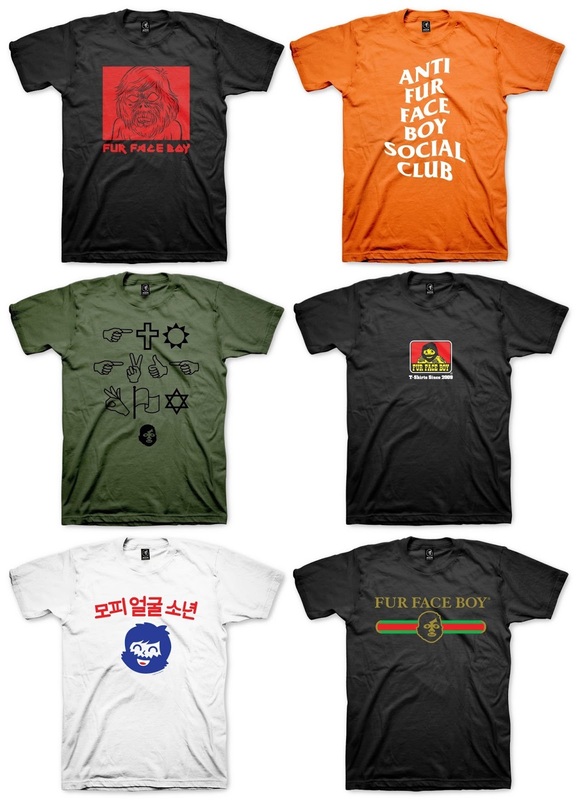 The first four of six designs in this awesome collection are available now at the RadioVelvet online store. 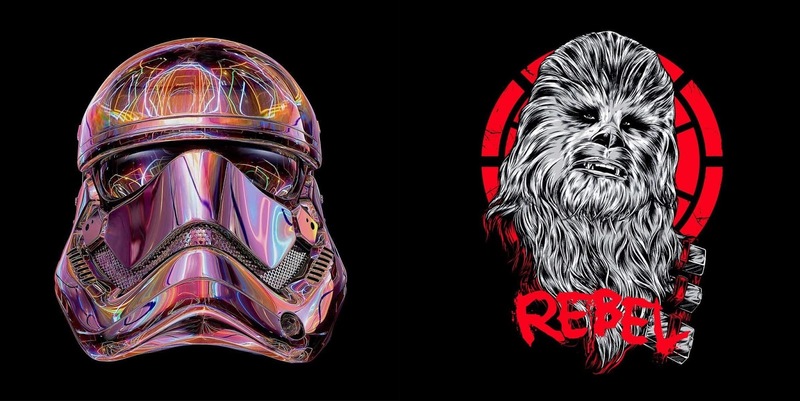 They include “Chewbacca” by Rhys Cooper, “Stormtrooper” by Luca Ionescu, “Kylo Ren” by Anthony Lister, and “Captain Phasma” by Justine McAllister. 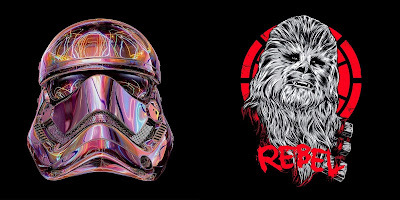 Each RadioVelvet x Star Wars: The Last Jedi Artist Edition T-Shirt is available in sizes S-XL and retails for $75. 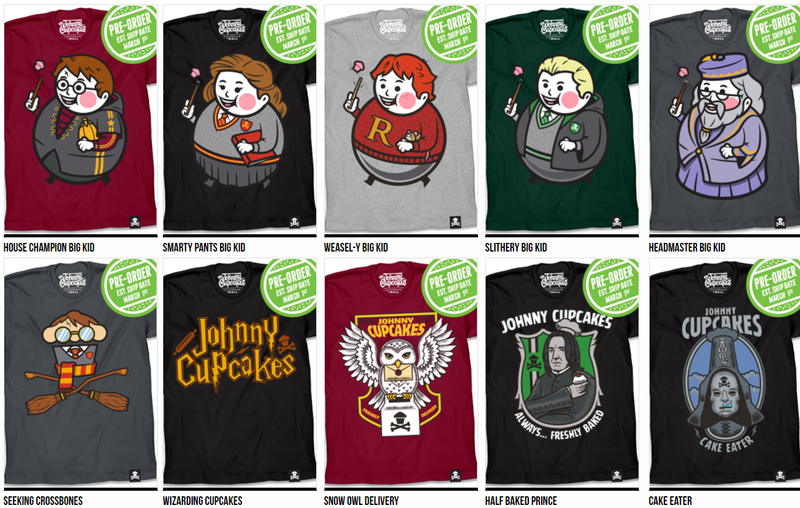 Johnny Cupcakes just released a freaking huge new collection of t-shirts inspired by Harry Potter! 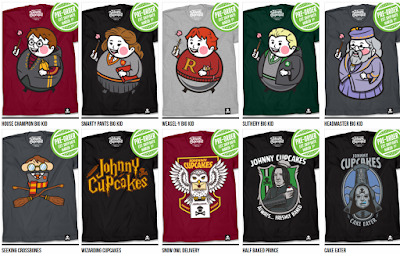 The “Wizarding World of Johnny Cupcakes” T-Shirt Collection includes five Big Kid designs featuring Harry Potter, Hermoine Granger, Ron Weasley, Draco Malfoy and Albus Dumbledore. This new timed edition collection also includes a fun Quidditch Harry Potter Crossbones design, a Harry Potter logo shirt and three crest tees. How can you pick just one!?! All of the Harry Potter “Wizarding World of Johnny Cupcakes” t-shirts seen here are currently available for pre-order, meaning you can still get all of these awesome designs in any size you want. 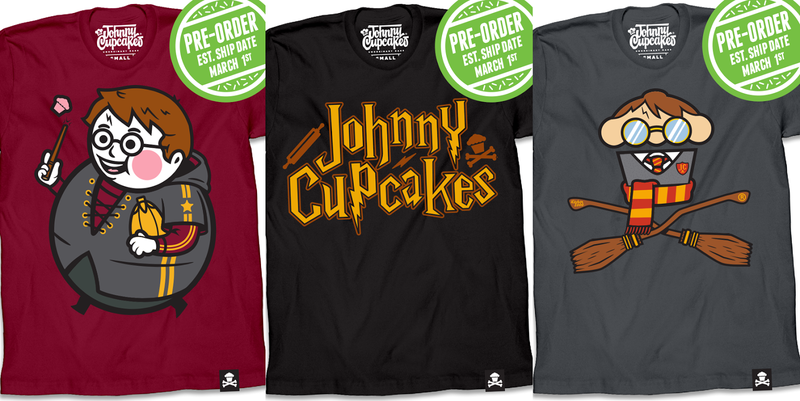 Each shirt retails for $39.99 and is available in mens and womens styles, sizes S-XXXL, at the Johnny Cupcakes online store. The rumors of Fur Face Boy’s demise was greatly exaggerated! Thankfully the hairy one’s back with a very special 2017 FFB Winter T-Shirt Collection! This music inspired collection includes six new t-shirt designs, a comfy looking pullover hoodie and a detective jacket. Which one is your favorite!?! The Fur Face Boy 2017 Winter T-Shirt Collection is now available at the FFB online store. Each design is available in a variety of sizes and on sale for just $9.99! 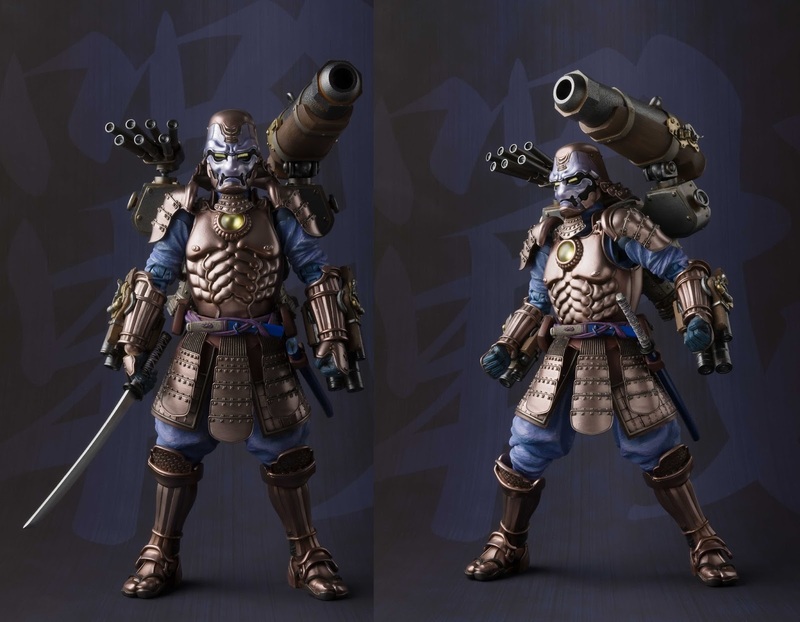 Bandai Tamashii Nations has unveiled the fourth figure in its killer line of Marvel Comics Meisho Manga Realization action figures! 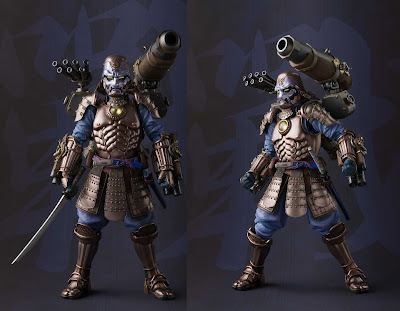 Check out the Avenger War Machine re-envisioned as a samurai warrior from feudal Japan. This highly articulated 7” action figure was arranged by Takeyuki Takeya and sculpted by Junichi Taniguchi and Takashi Yamaguchi. It includes two pairs of interchangeable hands, a sword, a backpack, and a stand. 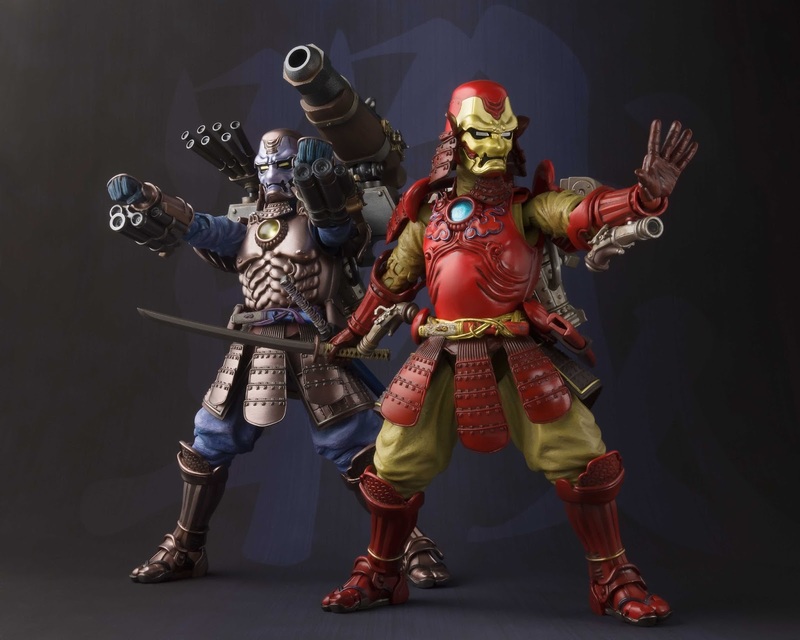 The Marvel Koutetsu Samurai War Machine Meisho Manga Realization action figure can be pre-ordered now at Entertainment Earth for $89.99 here. 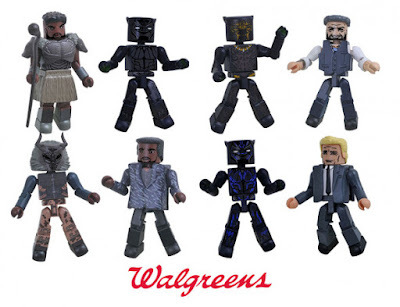 Diamond Select Toys has announced it will be continuing its Walgreens exclusive line of Minimates mini figures based on the Marvel Animated Universe! Marvel Animated Universe Minimates Series 8 is based on Marvel’s popular animated television shows Spider-Man and Avengers: Secret Wars and includes four 2 packs: Stealth Suit Spider-Man with Screwball, Spider-Gwen with the Jackal, The Wasp with MODOK, and Black Panther with Madame Masque. 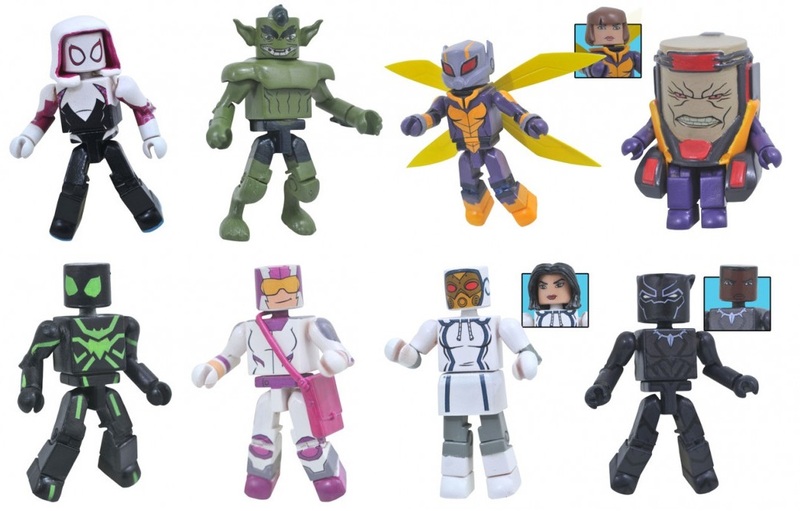 Each Marvel Animated Universe Minimates Series 8 Set includes two 2” mini figures featuring 14 points of articulation and a variety of interchangeable character specific parts and accessories. Look for this new series to arrive in Walgreens stores on or around April 1, 2018 and retail for between $10-15. ToyQube has unveiled its third colorway of their fantastic Astro Boy Statue of Liberty vinyl figure! 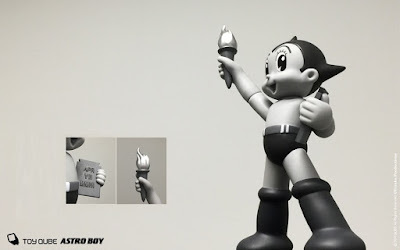 This officially licensed figure produced in conjunction with Tezuka Productions is now available in a monochromatic colorway featuring varying shades of white, black and grey. This mono version features Astro Boy’s birthday on the tablet in his left hand. The Astro Boy Statue of Liberty Mono Edition Vinyl Figure stands 9” tall and features articulation at the neck. 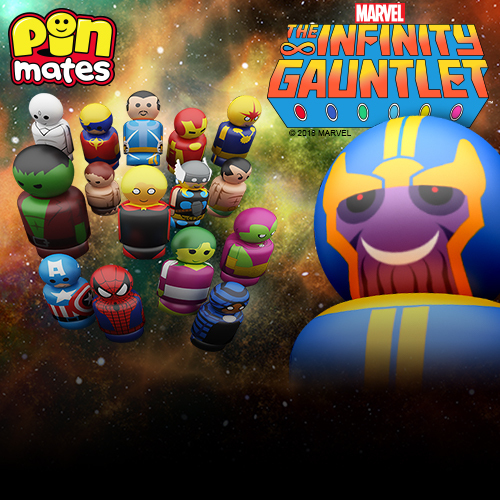 Collectors can order this awesome collectible now at the ToyQube online store for $95. Fans of Diamond Select Toys’ line of DC Comics Universe Vinimates vinyl figures need to head down to their local Walgreens ASAP to get their hands on these retailer exclusive Black Lantern Batman and Black Lantern Green Lantern Hal Jordan figures! 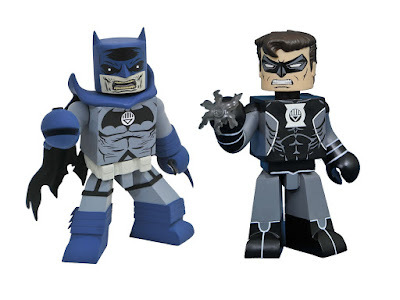 Each blocky 4” variant PVC figure strikes a distinctive pose based on their appearances in the popular DC Comics series Blackest Night, features ball-jointed neck articulation, and comes packaged in a full color window box perfect for display. Check out this super rad Star Wars Fitted Hat Collector Edition Blister Pack by New Era, which includes one size 7½ 59FIFTY All Over fitted cap detailed with iconic scenes from the original Star Wars trilogy along with five Character Armor 59FIFTY mini caps of Darth Vader, Stormtrooper, Chewbacca, C-3PO and R2-D2. 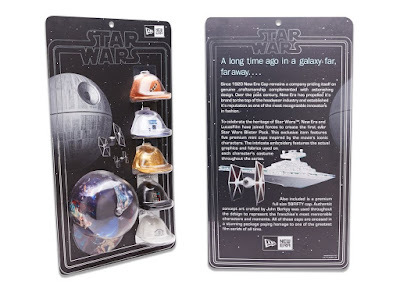 These rare fitted hats are all encased in custom blister card packaging that is sure to stand out in any Star Wars fan’s collection. 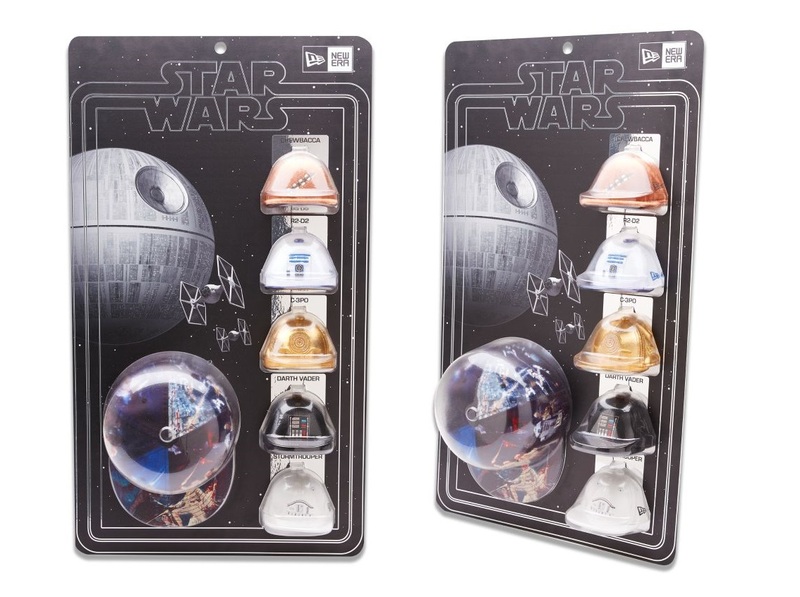 Each limited edition blister pack is individually numbered and limited to just 170 sets. Collectors can purchase this set now at the New Era online store for $225. 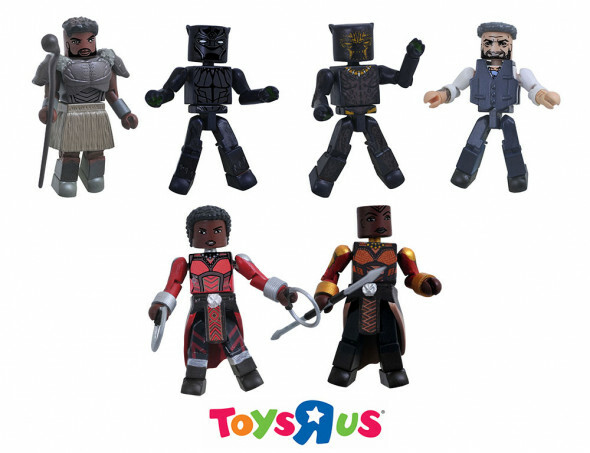 Diamond Select Toys is gearing up for the first Marvel film of 2018 with a killer new assortment of Black Panther Minimates!!! Now Marvel fans everywhere can delve deeper into the world of Wakanda with these super detailed Black Panther Movie Minimates mini figures. 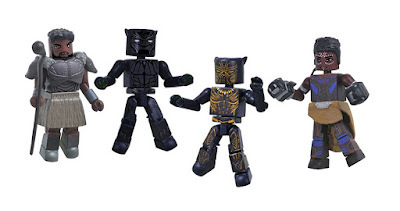 First up is the Black Panther Movie Minimates Box Set, which includes Black Panther, M’Baku, and exclusive figures Powered Up Killmonger and Shuri. 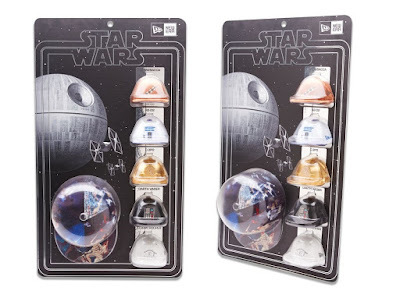 This set will retail for $19.99 and can be pre-ordered at Entertainment Earth now here. Then there’s the Walgreens exclusive assortment of four 2 packs, which will include Black Panther with M’Baku, Killmonger with Ulysses Klaue, Walgreens Exclusive Tactical Killmonger with Casino T’Challa, and Walgreens Exclusive Powered Up Black Panther with Everett Ross. There will also be a Toys R Us exclusive assortment of three 2 packs, which will include Black Panther with M’Baku, Killmonger with Ulysses Klaue and the Toys R Us Exlcusive Dora Milaje Nakia and Okoye. Each Black Panther Movie Marvel Minimates figure stands 2” tall, features 14 points of articulation and a variety of character specific accessories and fully interchangeable parts. 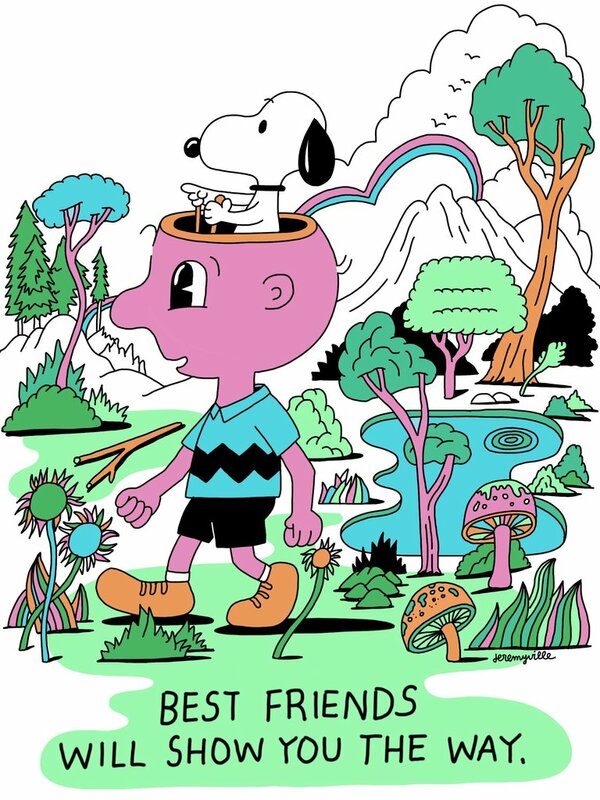 Dark Hall Mansion expands its new line of officially licensed Peanuts prints by acclaimed contemporary artists with this fantastic “Peanuts: Best Friends” giclee by Jeremyville! The Blot’s a huge fan of Jeremyville’s work, and it’s awesome to see the artist’s take on Charlie Brown and Snoopy in his unique artistic style. It really is true, best friends will show you the way! The Peanuts: Best Friends giclee fine art print by Jeremyville will be available in two sizes. The 18”x24” edition is limited to 150 pieces and retails for $75, while the 9”x12” edition is limited to 125 pieces and retails for $30. Both versions are available now at the Dark Hall Mansion online store. Medicom Toy is kicking off its new line of soft vinyl figures entitled MVP (or Micro Vinyl Pleasure) with a DC Comics themed wave featuring heroes and villains from the Batman corner of the DCU. 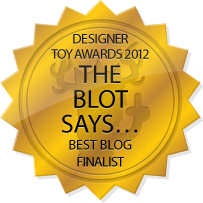 The Blot loves the stylized look of these new mini figures! 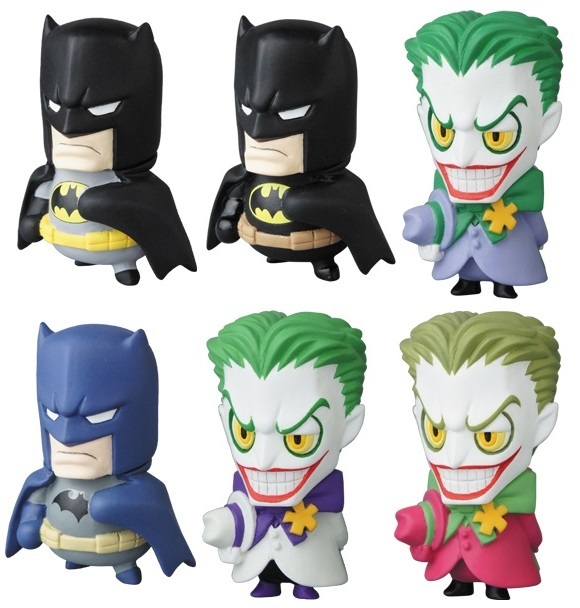 The DC Comics Micro Vinyl Pleasure Series 1 includes Batman, The Joker, Harley Quinn and Catwoman. Each DC Comics MVP mini figure stands approximately 2.25” tall and will be available in three colorways. 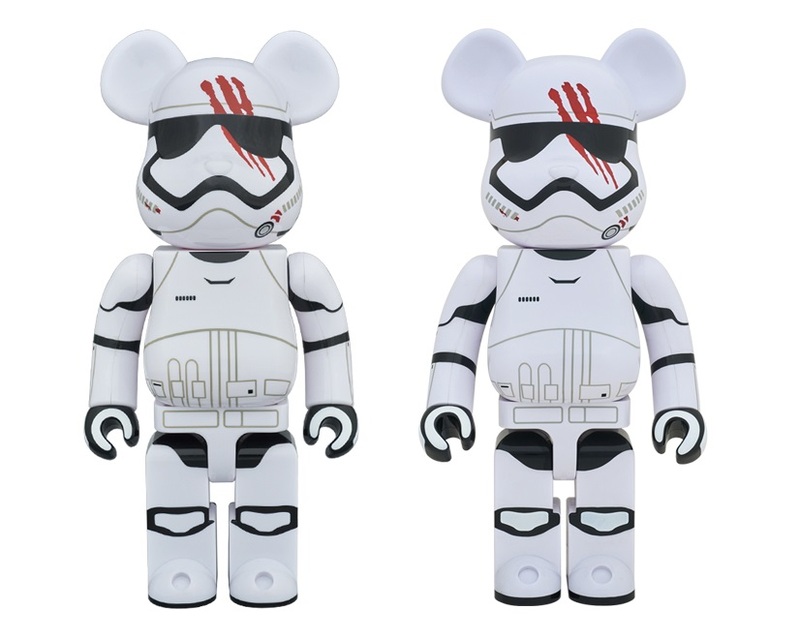 Medicom Toy always produces the coolest Star Wars Be@rbrick figures, and this The Force Awakens FN-2187 continues that trend! 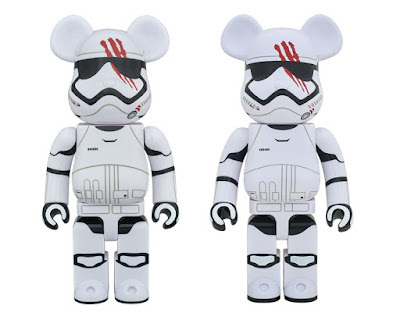 Before he was Finn, the legendary Resistance hero was known by The First Order as FN-2187. In his last moments as a Stormtrooper, Finn’s helmet was marked with the blood of an innocent civilian, which led him on his path to becoming a hero. That moment is memorialized here with this FN-2187 Be@rbrick vinyl figure. It will be available as a 400% Be@rbrick that stands 11” tall and will retail for around $75-125, and a 1,000% Be@rbrick that stands 27.5” tall and will retail for around $300-650.